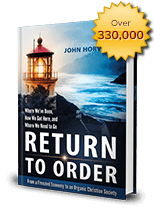 Return to Order is a book that criticizes the frenetic intemperance of modern life that throws off all restraint. In this sense, frenetic intemperance can be seen as a cause of abortion, which is often the result of sexual unrestraint. A return to order restrains the passions and provides the basis for a balanced and virtuous society. 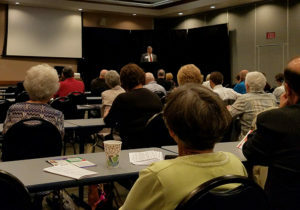 In this context, Life Tech of Sidney, Ohio held its annual conference on September 16, and asked author John Horvat to be the keynote speaker. Mr. Horvat spoke on “The Coming Pro-Life Challenges: What It Will Take to Win.” The event was held at the Stevens Student Center at nearby Cedarville University, a co-sponsor of the event. The program consisted of eight speakers who addressed aspects of the pro-life battle from embryotic stem cells research to Down’s syndrome abortions to brain death. Speakers included Seth Drayer of Created Equal, Dr. Dennis Sullivan of Cedarville University, Denise Leipold of Right to Life of Northeast Ohio, Elaine Russo of Heroic Media, Derek Doroski of Franciscan University of Steubenville, student pharmacist Stephanie Cailor and Nelson Henning of Cedarville University. The dynamic lineup was organized by Life Tech Board President John O’Neil. In addition, Mr. Horvat gave three suggestions about how to obtain these results. He told the audience not to give up the fight. He stressed the need to be constantly deepening one’s understanding of the fight and increasing the passion for the pro-life cause. Finally, he said that all must call upon God and the Blessed Mother and trust in the miracles that she will provide. The program and excellent speakers served as an occasion for pro-lifers in the area to know one another and participate in the fight. They also were able to learn about other life-related fields like Down’s syndrome abortion that is now being debated in the state legislature. Events like these are an important part of the effort to fight for America’s return to order. This entry was posted in Featured and tagged 'Return to Order' at Life Tech Event, America, coming pro-life challenges, frenetic intemperance, leadership, organic Christian society, Return to Order by RTO.org. Bookmark the permalink.